* Discounted female will be the cheapest of the group chosen. Below you will find our “alpacas for sale” list. In addition, we have a wider choice of females for sale who we don’t directly advertise. This is because we don’t want to sell all of our females in one go! However, if you want a female of a specific colour, pregnancy status or age, contact us and we will almost certainly have what you are looking for! 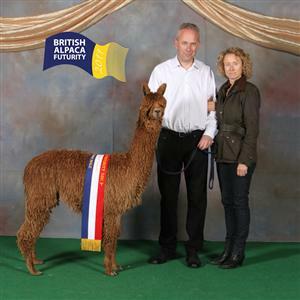 Whilst offering great value in our alpacas for sale, we also offer world class genetics from Snowmass, MacGyver, Accoyo – in addition to probably the friendliest herd in the UK. Please contact us for more details but most importantly – come and meet us! If you are looking at our website from outside the UK, you can take comfort in the fact that Spring Farm is BALAI registered and we have Type 1 Authorisation for our purpose built and converted van. We have in the past sold alpacas across the whole UK and in addition, Sweden, Holland, Belgium and France. 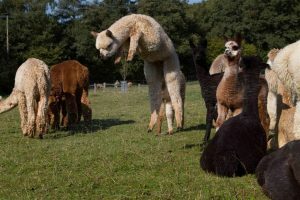 We are used to the whole export process and can advise on any issues that might be faced on buying a Spring Farm alpaca. Buying alpacas is about so much more than viewing a page on the web. We recommend you come and visit us even if you have no idea where you might go with owning alpacas. 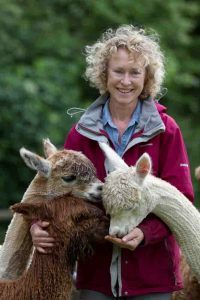 We can introduce you to the amazing world of alpaca ownership at one of our regular open days or, alternatively, we can tailor make a day to suit your availability. We have four years experience in alpaca walking here at Spring farm so that might be another option… or lastly, why not come and stay with us on the farm at “The Lodge” – our new holiday let venture – and live amongst our alpacas! Either way, you will get a far better idea as to whether owning alpacas is right for you. Lastly, we regularly have young males and wethers for sale who we don’t advertise directly, either because they are yet to reach the right age or because we are trying to keep the grass under control! They will all be halter trained and extremely friendly, so contact us for current availability. Sometimes its all just for fun!